Scott McDonald headed a late equaliser for Motherwell after Partick Thistle failed to finish off their visitors at Firhill. Chris Erskine capitalised on Steven Hammell's mistake in the 31st minute to net his sixth goal of the season but Ade Azeez squandered three excellent opportunities to double their lead. McDonald came alive after moving from left midfield to a more natural striker's role and he had a goal controversially disallowed before he rose to head home Richard Tait's 83rd-minute cross and seal a 1-1 draw. The recent signing allowed Ryan Edwards, Steven Lawless, David Amoo and the advanced Erskine to move around and cause Motherwell problems in front of him. However, Ryan Scully stopped Ryan Bowman's attempted lob at full stretch. The left-back attempted to pass across the 18-yard line towards Ben Heneghan but it turned into a perfect assist for Erskine, who slipped the ball past Craig Samson. The Jags had a great chance early in the second half when Azeez held off Stephen McManus at a high ball and got a return pass from Erskine that sent him clear, but the former Wimbledon striker dragged his shot wide. Amoo had a shot saved after getting past Hammell and Azeez again shot wide after being played through by Barton. But the visitors began to look more dangerous after McDonald and Louis Moult swapped places with the latter going back into a four-man midfield. The offside flag was raised but footage apparently showed the Australian was on. Samson blocked from Azeez from another one-on-one before Erskine went off injured while Moult made way for James McFadden. Thistle came close again when a long-range shot from Edwards skimmed the post. McManus and Heneghan could not convert after set-pieces caused Thistle problems and Samson denied Amoo before McFadden set up Tait to cross for McDonald, who headed into the top corner from six yards. 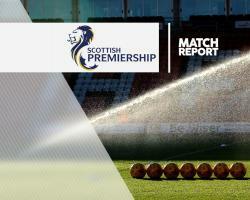 Motherwell pair Bowman and Chris Cadden plus Thistle sub Kris Doolan all had late efforts saved as both teams chased a winner.